Over on Fangirlish, they’ve been publishing something called “Fangirlish Favorites”. Which is a way they’ve been ushering in the new year. Below, you’ll find a master post of all my Favorites listed here — and links to Fangirlish’s lists, where you can see the rest of the team’s favorite media of 2014. Happy New Year, everyone! This was a book that has been on my shelf for a long time. Published in 2008, it’s a book with a simple premise: Jane Margaux’s imaginary friend, Michael, comes back into her life and they both fall in love. Hallmark Channel made a movie starring Alyssa Milano as Jane last year, if it sounds familiar. I read this book and MY GOD did I fall in love with it! The book goes deeper than the Hallmark movie ever did, and has such fantastic detail. Michael and Jane’s relationship is so beautifully casual and sweet! I strongly recommend reading it! Winter’s Tale with Colin Farrell, Jessica Brown Findlay, Russell Crowe, and Jennifer Connelly. It was written and directed by Akiva Goldsman, who wrote for movies such asThe Da Vinci Code, Practical Magic, and Insurgent. It’s a romantic fantasy set in an AU New York where Farrell’s character, Peter Lake, falls in love with Findlay’s character, Beverly Penn, who is dying from consumption. Crowe’s Pearly Soames tries to stop it. It’s a classic story about Angels vs Demons, good vs evil, the power of love, and what happens to us after we die. At first, watching this movie, I was kind of “eh” about it. But I watched it again recently, and it is actually a captivating tale. It makes you think and your heart swoon. I just can’t seem to get past the actor who brilliantly played Loki in Thor, The Avengers, andThor 2. I first fell in love with his acting when I watched The Avengers. It had been a long time since someone had played a villain that made me question my very loyalty to superheroes. And it was Loki that got me into the Marvel fandom, back into Tumblr, and even helped me with some personal things in my life. So, thanks, Tom Hiddleston. You really did change my life. Ohhhhh…. Well, I think the greatest guilty pleasure is a tie between Twilight and Barbie in the Nutcracker. Being an English major, I have many friends who despise these series for not being well written. But I find them enjoyable. Barbie in the Nutcracker has an excellent, romantic, twist on E.T.A. Hoffmann’s story. And Twilight, yes, you either love or hate it. Some things might bug me with some of the series, but I do find the romance between Edward and Bella compelling. It brings me back to high school. And a time where life was simpler. I’m a sucker for Hallmark movies. Really. During December, just pop on the Hallmark Channel and relax. They play movies all afternoon and evening. And they’re not so bad. My favorites are Sundays at Tiffany’s (with Alyssa Milano), The Christmas Shepherd (Teri Polo), November Christmas (Sam Elliott), and Help for the Holidays (Summer Glau). Whenever someone asks me a book recommendation, I always point them in Neil Gaiman’s direction. His works include Stardust, Sandman, The Graveyard Book, and, most recently, The Ocean at the End of the Lane. Which is one of my favorites. Gaiman’s works center on fairy tales, but they always have some kind of new twist to them. 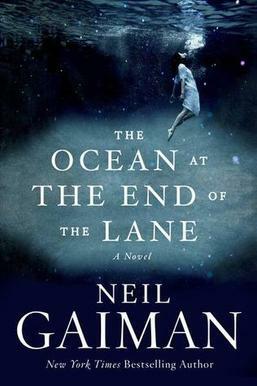 The Ocean at the End of the Lane follows the memories of a man, who visits a home he used to hang out at when he was a child. There live the Hempstocks: a girl, a woman, and a grandmother. They help the boy overcome a terrifying monster. The novel is directed at adults. It centers on themes such as the search for self-identity and growing from a child to an adult.